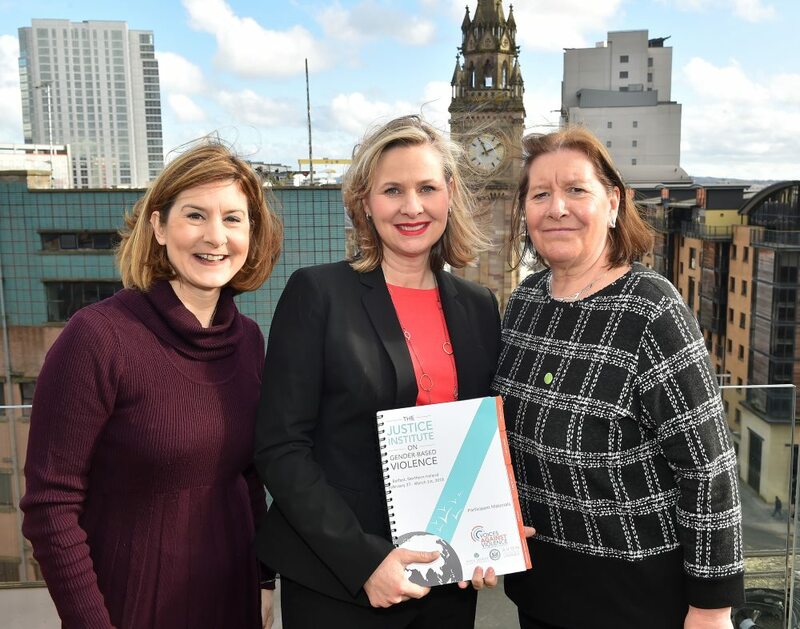 An international training programme to help tackle gender-based violence in key problem areas across the globe is to take place in Belfast at the end of this month. Supported and implemented by the Avon Foundation and in partnership with Avon Cosmetics UK, Vital Voices Global Partnership and the US Department of State, the Belfast event will be the first ever Justice Institute to take place in in the UK. Between 2016 to 2017 alone, a quarter of all murders in Northern Ireland had a domestic motivation, with Northern Ireland police responding to some form of domestic incident every 18 minutes of every day. In this time the 24 Hour Domestic & Sexual Violence Helpline managed almost 30,000 calls (29,657) from people seeking help, including pregnant women and those with children. Due to the prevalence of the issue and a real need for help in this area, as incidents reach a 10-year high, Belfast has been selected as one of the seventeen cities across the world to receive the course. Christine Jaworsky, Director, Avon Foundation for Women, said: “Belfast was identified as uniquely well-suited to benefit from a Justice Institute not only due to its unique history of conflict and the impact of this on intimate partner violence, but also due to its network of dedicated advocates working tirelessly to support survivors of violence. “Shockingly statistics show that police respond to an average of 60 domestic-related incidents a day and that domestic violence in Northern Ireland is at its highest level in 10 years. In partnership with the Avon Foundation and US Department of State, since 2014 Vital Voices has implemented 17 Justice Institutes in 10 countries, including Argentina, Brazil, Chile, Colombia, India, Mexico, Nepal, the Philippines, Romania and South Africa. The Belfast Institute, which will take place at the Merchant Hotel from the 27 February to the 1 March, will be tailored to meet Northern Ireland’s specific experience of gender-based violence, reflecting the regional, legal and cultural environment. Participants will range from those involved in the criminal and civil justice systems – judges, prosecutors, law enforcement, and service providers – as well as women leaders locally, and NGO service providers. Nicole Hauspurg, Program Manager for Human Rights at Vital Voices Global Partnership, said: “The Justice Institute on Gender-Based Violence in Belfast aims to engage allied advocates in Northern Ireland to collectively address common barriers to effectively investigate and prosecute gender-based violent crimes, where existing laws are not always understood or consistently enforced, often leaving women unprotected and their abusers unaccountable. Following last year’s hugely successful partnership announced between Avon and Refuge around International Women’s Day to combat domestic violence and coercive control, nearly a year on the company is continuing to make strides to raise awareness and seek justice for those affected by domestic violence globally. On top of the innovative and progressive work the brand has done with Vital Voices and the US Department of State, the Avon Foundation has also contributed over $60 million since 2004 to support awareness, education, direct services and prevention programmes aimed at stopping gender violence worldwide. From Mexico to the Philippines, Romania to Colombia, to date over 850 participants across 10 different countries have been trained through the Justice Institutes. In all, 96% of participants have reported a deepening understanding of domestic violence and sexual assault in their countries, and 95% have reported gaining a sense of empowerment to combat these crimes.